A Must in Every Office is owned by Bastien Mensink and the company's main purpose is to further develop, professionalize and promote the excel add-in ASAP Utilities. Bastien Mensink is the author of ASAP Utilities. Worldwide 750.000+ users and 18.000+ organizations use ASAP Utilities. We truly believe that ASAP Utilities is a must in every office (now you know where the companies name comes from). It's guaranteed that more than a few of the tools will be just what you've been looking for to fill the gaps in Excel. 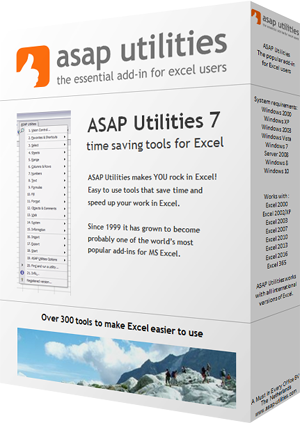 ASAP Utilities is a powerful Excel add-in which adds new functionality to MS Excel to save time and speed up your work. All over the world people are enthusiastic about ASAP Utilities. Download our fully functional 90-day Business trial or the free Home&Student edition (for home projects, schoolwork and use by charitable organizations).